A superb walk from Dufton featuring the dramatic valley of High Cup and an exploration of the moorland tarns of Backstone Edge. The aim of this walk was to explore some more of Backstone Edge, a fell very much in the shadow of the higher fells immediately to the north but which had nevertheless made a strong impression on me in my early walks in the North Pennines. In combination with this I wanted to revisit High Cup, the steep-sided valley that is one of the finest features in the whole Pennine range. From the small car park in Dufton it was a short walk back through the village to join the Pennine Way for the start of a gradual climb. In the early stages this followed the access road to the farm at Bow Hall before turning into a a track. Even without gaining too much in height it did not take long for the retrospective views across the Eden valley to really open out. At the top of the first pasture after entering access land I made a detour from the bridleway through some empty sheep pens to visit the unnamed and unmarked grassy top with the 445m spot height. I’d noted that this rather innocuous looking mound was on the list of Fours (hills over 400m). At the moment I don’t have any intention of attempting this particular hill list but I thought as I was so close I may as well visit this particular one. Returning to the Pennine Way the bridleway weaved its way through a rocky area with a lime kiln before continuing upwards to eventually arrive at the lip of High Cup. Without doubt one of the finest natural features, not just in the North Pennines but the whole country, High Cup is a deep valley which looks like someone has taken a giant cake slice and removed a wedge of fell side. The steep flanks and crags lining the valley add to the sense of drama and the walk along the northern edge of it was nothing less than superb. As I neared High Cup Nick, where a small break in the crags allows a path to climb up from the valley floor, the wind was blowing quite cold and fierce from the east so I dropped a short way down into the Nick itself which sheltered me while I ate some lunch. Afterwards I retraced my steps a short way before climbing the pathless grassy slope to the right of a rocky edge to start the next stage of the walk, a crossing of Backstone Edge. I wasn’t expecting to find a path but on reaching the edge above High Cup a thin trod led me west to the sprawling cairn marked on the map as Narrowgate Beacon. The slightly different perspective afforded by the extra elevation only served to make the views down into High Cup and across to Murton Fell even more stunning. At Narrowgate Beacon it was turn to swing north and finally leave High Cup behind. I continued to follow a thin path passing along the way a number of cairns to reach a very well made example on a little knoll at the 674m spot height on the OS map. The views were now out over the Eden valley towards the Lake District skyline. While it would have been easiest to remain on the modest edge to reach the trig point I wanted to go and find the many tarns on the moorland plateau to the east. To do this I turned east before reaching Little Rundale Beck and first arrived at the fairly large unnamed tarn to the south of Little Rundale Tarn. From there I passed several smaller tarns to reach Little Rundale Tarn. Continuing north I next reached Seamore Tarn. Unfortunately it looked like someone had pulled the plug out of this one and apart from a small pool of water at its eastern end it was empty. Between Seamore Tarn and the summit of Backstone Edge were a whole host of smaller tarns which required a bit of careful navigation. I don’t think I’ve seen such a high concentration of tarns and although they all had the same heathery surrounds it was still a worthwhile if slightly rough and moist diversion. The summit of Backstone Edge is marked by a cairn with a stake in it. A short distance to the west and 7m lower is the trig point. From both the summit and the trig point there is a fine view to the four highest fells in the Pennines, Cross Fell, the two Dun Fells and, immediately north of Backstone Edge, Knock Fell. The trig point excels more though in the view west to the Lake District. It was slightly too hazy to pick out individual fells (with the exception of Blencathra) but in the right conditions it is possible to identify a whole host of Lakeland fells from this vantage point. From the trig point I made my way to the shooting box at the top of the track leading up from Great Rundale. From there it was a short walk to visit Great Rundale Tarn, possibly the finest tarn of the day. The name is slightly odd because, if the map is correct, the outflow of the tarn actually feeds Maize Beck to the east rather than Great Rundale Beck to the west. From the tarn I walked back to the track by the shooting hut and turned left for a long descent past the disused mines of Threlkeld Side and continuing on above Great Rundale. I’d been looking forward to this section as this had been my route of ascent when I’d first climbed Backstone Edge in 2007 and, as with similar areas scarred by mining activity, it made a big impression on me. It proved to be just as fine a route in descent as it did in ascent with the unmistakeable silhouette of Dufton Pike a striking object ahead of me. Upon reaching a junction of paths below Dufton Pike it was then an easy stroll back to Dufton. This was a superb walk, one of the best I’ve done to date in the North Pennines. 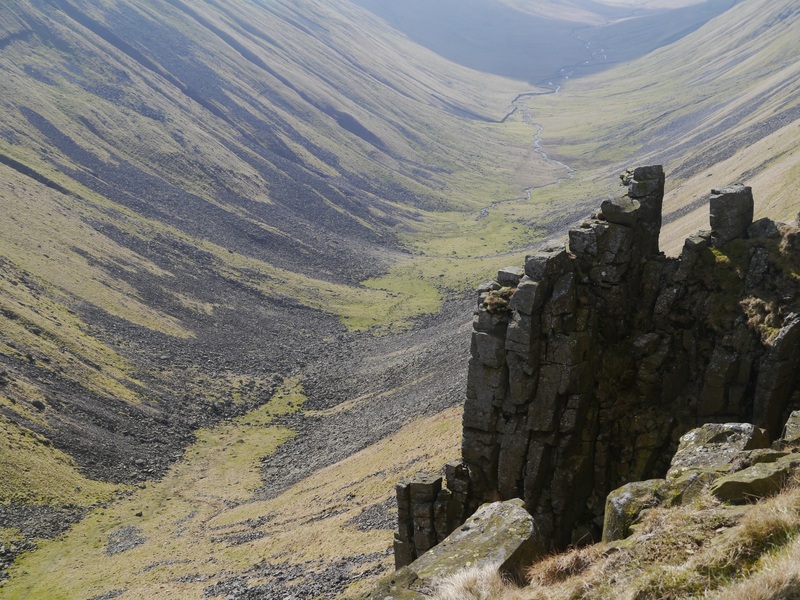 High Cup by itself was stunning but when you also add the walk along Backstone Edge, the views of the highest Pennine hills, innumerable tarns and a fine descent above Great Rundale the walk was full of highlights. Highly recommended but make sure you do it on a clear day!